My building, which was erected shortly after the Mayflower docked, has bad plumbing. 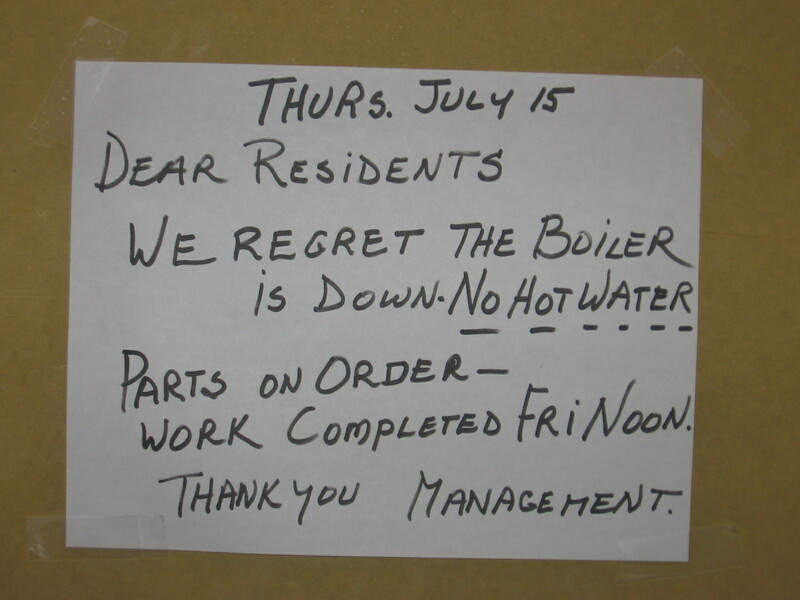 For the third day in a row, the hot water has been out, and Building Management has been stymied when it comes to fixing it. Finally, someone had a daylight moment and realized, “We need to replace some parts!” Probably it is just the hot water “on” switch … Possibly, it is something a bit more complicated than that, but I am suffering some agitation so I’m feeling surly. In addition, I am the only tenant in this brownstone of eighteen apartments who has reported the problem every day from Day One. Building Management thought they fixed it twice this week to no avail. Either all my neighbors are out of town, or they are all subscribers to the Saturday Night Bath Club, or they just assume that I’ll do all the calling. Considering that it’s been the hottest summer in years, in theory, the hot water being out is not as much of a crisis as if it was inoperable in the dead of winter, but even when it’s 85 degrees outside, I’m not a proponent of taking an icy cold shower on any day of the year, much less three days straight. I might feel different about this situation right now if my shower stall was outdoors, but this is a residential neighborhood on Manhattan’s Upper West Side. Everywhere I look there’s either a small child or a large retriever on the prowl, so if my shower was located in the great outdoors of the West Seventies, the peace might be disturbed with sounds of terrified wailing and agitated barking. Maybe French women in my over-40 under-death age group have the capacity to stay in shape by just walking and eating sparingly, but I’m only a touch French, and very American, so most of me has a fondness for laying around, drinking too much, and eating in front of the TV. It’s a long way from Juliette Binoche-ville over here, but easily just an arm’s reach from brioche-land. Yet, I am not intending to do any exhibitionist showering, so dwelling on this lunacy must be a side effect of cold shower delirium. I just long to take a comfortably tepid shower instead of what I have been doing first thing every morning since Wednesday, staring a heart attack straight in the eye with every hair on my being, including my eyebrows, perpendicular and frozen. On some level though, this longing for heat in a summer that rivals the fire in hell does seem perverse. This entry was posted in Humor and tagged bad plumbing, heat, hell, summer. Bookmark the permalink.